＞ The 2018 Eniwa Industries Festival is coming soon! The 2018 Eniwa Industries Festival is coming soon! The Eniwa Industries Festival, once postponed due to the Eastern Hokkaido Iburi earthquake on September 6th, is now set to begin once again! 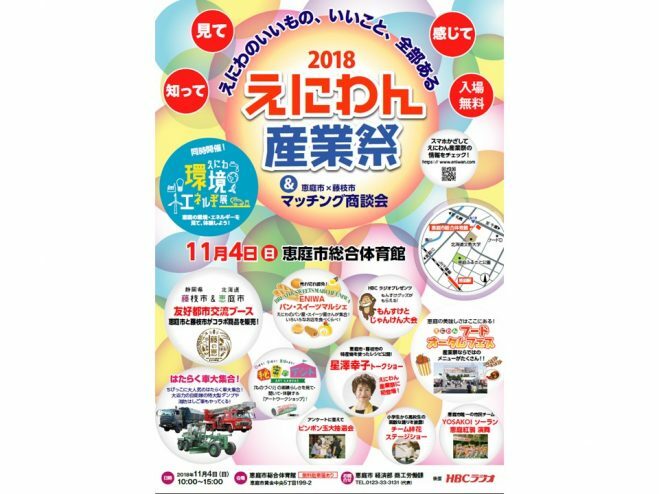 This year, children are very much welcome to attend a special “Secret Hideout” workshop, where they can watch, listen, and experience the many aspects of manufacturing in Eniwa. The workshop will showcase multiple industries around Eniwa and feature the capabilities of local companies. Availability is limited, so it is recommended to attend the venue early. There will also be many local organizations and a variety of companies attending, where event goers can learn more about Eniwa’s diverse network of business and industry. In addition, the “Eniwa Environment and Energy Show” will be held at the same time. Participants can learn from an informative Q&A and enjoy a driving simulator too! Join in the stage event or the stamp rally to receive your chance to win a gift souvenir!